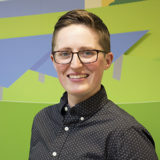 Amber moved from Connecticut to central New York to attend Ithaca College for a degree in environmental studies, concentrating in land use and ecosystem management. After college she spend two years working in the wine industry in the Finger Lakes as a tasting room manager, vineyard and winemaking assistant, and distiller. Amber moved to VT in 2015 with her partner Dominique, who is a PhD candidate at UVM. She spent some time working for VT Artisan Coffee & Tea Company as a production specialist in their roastery. Amber enjoyed working with specialty agricultural products, but she decided to make a career change to the solar industry where she can make a positive impact in her community every day. When not installing solar panels, Amber enjoys cooking delicious food, growing vegetables in her garden, and hiking with Dominique and their little black lab pup named Jolie.